← Watt about the comments? Roy Spencer on the Global Warming Slowdown. The latest post on Watts Up With That links to a post by Roy Spencer called Global Warming Slowdown: The view from Space. In this he compares the model estimates for the temperature of the lower troposphere with satellite measurements (RSS and UAH). He shows the figure that I reproduce below (credit : Roy Spencer). The basic point that he makes is that model predictions and the satellite measurements diverge more and more with time. Comparison between model estimates and satellite measurements for the temperature anomaly in the lower troposphere (credit : Roy Spencer, John Christy and based on data from the KNMI Climate Explorer). He suggests that there are 3 possible reasons for the divergence between the models and the measurements. 1. We’ve underestimated the amount of energy going into the oceans (as suggested by a climate scientist called Keven Trenberth). 2. We’ve overestimated climate sensitivity – (i.e., increased CO2 levels have less of an influence on global temperatures that we realise). 3. Man-made aerosol pollution has had an increased cooling effect. I find all of those perfectly reasonable suggestions and I don’t have any real sense of which is correct or if there isn’t maybe even other alternatives. Roy Spencer’s view seems to be that we’ve over-estimated the influence of CO2 on global temperatures. This could well be correct and, in general, I found this post quite reasonable and balanced. However, what was unclear was what role Roy Spencer thought that the oceans played in global warming. It’s clear that energy going into the oceans can have a big influence on how global surface temperatures increase. Why is this? Well, the specific heat capacity of water is about 4000 J kg-1 K-1. This means that it takes 4000 J to increase the temperature of 1 kg of water by 1 K. For land it is about 840 J kg-1 K-1. Let’s start by considering the land. Land makes up 30% of the Earth’s surface. Clearly Solar radiation cannot penetrate into land and so is all aborbed at the surface. It can clearly be transported below the surface, but given that convection isn’t possible, I suspect it can’t go very deep (I could be wrong, so feel free to correct me if so). If we assume it penetrates about 1m, and if we assume a density of 4000 kg m-3 this gives us a total mass of land that can be heated by solar radiation of about 6 x 1017 kg. If I multiply this by the specific heat capacity I get that it would take 5 x 1020 J to increase the land temperature by 1 K.
The oceans are slightly more complicated in some sense because Solar radiation can penetrate more deeply and currents and convection can transport this energy to the deeper parts of the ocean. There is some suggestion that it could go as deep as 2000 m. Doing a similar calculation as above and using that water has a density of 1000 kg m-3 I get that the total mass of water in the ocean that can be heated is 7 x 1020 kg. Multiplying by the specific heat capacity of water gives that it would take 3 x 1024 J to increase the temperature of the oceans by 1 K. I accept that this is rather simply and ignores temperature gradients and that not all parts will be heated by the same amount. However, it does illustrate that to change the ocean temperature by a certain amount requires orders of magnitude more energy than the land. The figure below is one I’ve shown before, but it illustrates that the energy that has gone into the land and atmosphere (brown portion) is far lower than the amount that has gone into the oceans (blue). I will acknowledge that this figure suggests that the amount of energy going into the land and atmosphere is about 1022 J which is quite a bit bigger than what I estimated above. I think this is simply because I ignored the atmosphere which actually has a mass of about 5 x 1018 kg and a specific heat capacity of 1000 J kg-1 K-1 and so can also absorb quite a lot of energy. 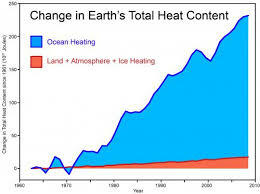 Change in Ocean and Land heat content since 1960. Anyway, the figure above shows that the oceans appear to have absorbed (since 1970) about 10 times as much energy as the land and atmosphere. Therefore a small error in how much energy is being absorbed by the ocean (by not realising that it can penetrate as deep as 2000 m, for example) can have a big impact on how much energy is then available to heat the land and atmosphere. Since the land and atmosphere dominate the changes in global surface temperatures (since the oceans require a lot of energy to change its temperature substantially) this can then result in the model overestimating the change in global surface temperatures. I don’t know if this is correct, but it is certainly plausible. If measurements actually indicate that we have been underestimating how much energy is going into the deep ocean, it becomes even more plausible. There was one other point I was going to make. 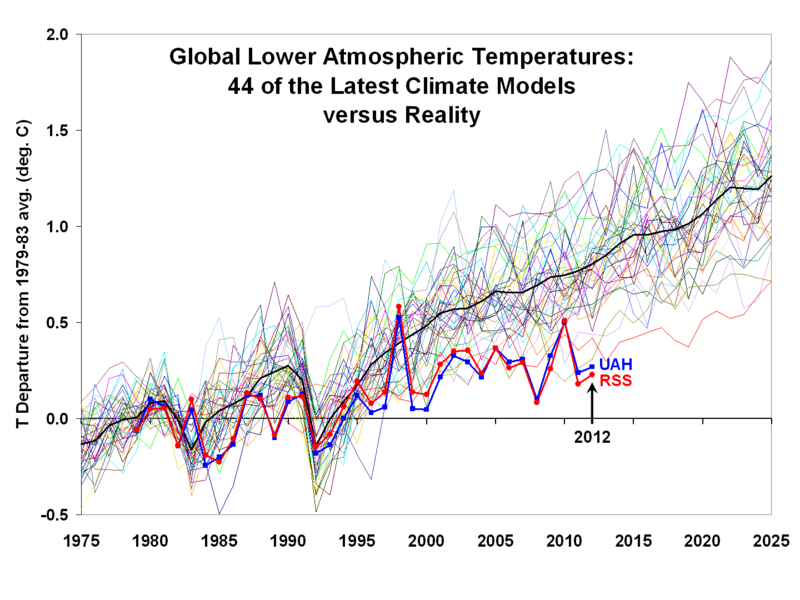 There is much criticism of the climate models because they appear to be overestimating the changes in global surface temperatures. However, I suspect that these model actually deal with energy, rather than temperature. Presumably they calculate how the energy from the Sun is transported through the atmosphere and how this energy then interacts with the land, oceans and polar ice. The models then presumably calculate how the re-radiated energy is transported back out through the atmosphere. If the result is that there is an energy imbalance the excess energy will act to heat the land, atmosphere and ocean. As I mentioned above, if the models underestimate how much energy is going into the oceans, they will over-predict the rise in surface temperatures. However, one could get a sense if the models are reasonable by comparing the predicted energy excess with that observed. Satellite observations suggest an energy excess of 0.5 W m-2. If the models are consistent with this, then one could conclude that the most likely reason for the divergence of the models with observations is a problem with how this excess energy is distributed between the oceans, land and atmosphere. Similarly, if Roy Spencer thinks that the problem is simply that we’ve overestimated the climate sensitivity he should be able to produce a prediction for the energy imbalance that could also be compared with observations. This entry was posted in Climate change, Global warming, Roy Spencer, Watts Up With That and tagged Climate change, Climate models, Earth's heat content, Energy imbalance, global surface temperatures, Global warming, Ocean heat content, Roy Spencer. Bookmark the permalink.